I suppose it was only a matter of time before he waded into this particular pool, but today, Neil Gaiman announced he’s working with the folks at The Odd Gentlemen–the guys who made the absolutely delightful Misadventures of P.B. Winterbottom–to make an episodic game called Wayward Manor. The game sounds whimsically reminiscent of Tecmo’s Deception on paper, and if you get that reference, you’re my hero for the day: You’re a ghost who died in a house in 1920’s New England, and it’s your job to innovatively scare out the scummy folks who inhabit it. In between, the ghost learns about the nature of his own death, and a greater danger threatening both living and dead. The game’s first episode is set to hit in December of this year on PC, Mac, and tablets–sorry console folk–and is already available for pre-order from the game’s official site, along with the pleasantly tantalizing announcement video Gaiman made, which is embedded below. The game’s already well on its way, so it’s not necessarily a Kickstarter, however, they’ve taken a page from the Kickstarter playbook in that those interested in more of the game can speed along Episode 2 by grabbing up one of the items in the website’s shop, which range in price and awesomeness from a download from the game’s soundtrack and a digital artbook for $10/$20, to having an NPC named after you or having dinner with Gaiman himself in Los Angeles for $1000/$10,000. All the items will net you a copy of the game. None of the items will net you a shot at Amanda Palmer. Please do not ask. 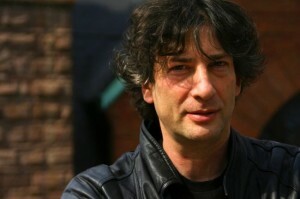 Yes, of course I was hoping for a more adult fantasy title, and being in the middle of finally reading American Gods after years of procrastination when this announcement happened didn’t curb that initial crestfall, but Gaiman in Coraline/Graveyard Book mode is still brilliance, and he’s paired with the right folks to match the tone in both those. The final product is guaranteed to deliver.